Transportation traditionally is done on wheels. However, recent developments have made it possible to build linear motors which obviate the requirement of linear motion generated by rotary motion. We have been designing and building linear motors for ropleless elevator applications since 2007, and have expertise in the design, implementation and control of such machines. Linear motors designed for vertical applications have the additional requirement of low deadweight; the mover of the motor must be as light as possible, meaning that the magnetic circuit elements may work in the saturated region. This assumption greatly complicates the design. However, the methods that we have developed in this area, subject to patents, mean that we can do such designs swiftly. The expertise translates well to horizontal applications where low mass means high acceleration. Japanese elevator manufacturer. The project is continuing. We have designed and built two linear motor designs for 150kg payload capacity, and have completed design of 450kg payload system with a speed of 2.5m/s, under contract from a well known Japanese elevator manufacturer. The project is continuing. In recent years microsystems design and manufacturing have become one of the most prominent research areas all over the world. It has accelerated the drive towards the creation of small size products with dimensions in the range of cubic millimeters (catheters, implants, miniaturized intelligent sub-systems, etc.) combining micro-parts machining and assemblies. The area of micro parts machining and assembly involves a vast set of technical disciplines and engineering solutions including but not limited to: mechatronics design, high precision mechanics, motion control, vision based control; mechatronics man machine interfaces, teleportation, optimization of assembly tasks, etc. In this project we addressed several issues related to design of laboratory microfactory workstations aimed to laser assisted micromachining, micro parts handling and visual inspection. The workstation consists of four stations (i) laser assisted manufacturing station, (ii) visual inspection station and (ii,iv) two manipulation stations interconnected by a rotational infestation transportation mechanism. The problems we addressed within this project are numerous and very diverse. They include mechatronics design of high accuracy systems, high precision motion control systems, PZT based drive control, the visual inspection, the development of the software environment for control system design in mechatronics systemms, integration of sensors and energy sources. All this allowed us to design and manufacture a prototype of microfactory workstation capable of laser-assisted manufacturing, inspection and mnipulation of milimeter size parts. The layered modular design of mechatronics systems resulted in the simple designs and better performances. Extensive work on motion control allowed us to reach accuracies of the positioning systems in range of nanometers (for PZT based actuation). The developed parallel miniature delta robot with works pace 4x4x4 cm and positioning accuracy 10 micrometers, the PZT based xy planar positioning stage with workspace 4x4 cm and accuracy 50 nanometers (limited by available linear encoder), the control of galvanometric positioner for laser together with versatile laser power and beam focusing control, the inter-station rotational transportation system with accuracy of 0.1 miliradian and the vision inspection station with automatic zoom and magnification control are main hardware elements of microfactory workstation capable of manipulation of sub-millimeter size parts and machining parts with features of a few hundred micrometers (within the power range of the laser used in project). All stations have modular design and allow easy interchange of the layout. Being computer controlled devices developed sub-stations and workstations as a whole (with 11 mechanical dof, complex laser control and vision based inspection station) are to great extend dependent in their operation on the control software. In this project we have extended the environment developed in our laboratory to design modular, highly portable control software for all stations and microfactory as a complex mechatronics workstations. The structural similarities of the control software for very diverse sub-stations are result of the strict following of the layering method adopted in the structural development of teh microfactory workstations. Development of multi-disciplinary design optimization platforms has become crucial to satisfy stringent performance expectations for many complex systems such as aircrafts, automotive and similar. Being multidisciplinary systems, performance of such devices cannot be fully exploited unless MDO techniques that account for their inherent design couplings are employed for their optimization. Design of best performing engineering systems necessitates a good understanding and optimal utilization of interactions among their disciplinary design components. These interactions, also known as design couplings, have been deﬁned as the design interrelationships among engineering disciplines within a multidisciplinary system. Robotic systems similar to many mechatronic systems are examples of controlled mechanical systems that require both the design of a mechanism—often referred to as a “plant” and a controller. In collaboration with Dr. Patoglu, Dr. Kiziltas focuses on the development of co-design frameworks to robotic systems such as a VSA in an effort to move towards systems having otherwise unattainable levels of performance. 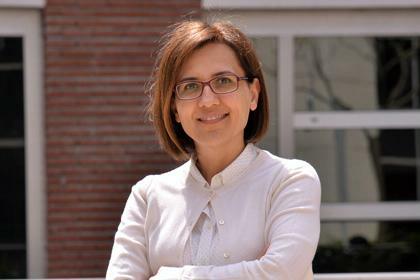 Dr. Kiziltas’ research addresses the challenges of system design from an interdisciplinary engineering perspective, with a focus on using automated design tools (such as topology optimization) and artificially engineered composite materials. The development of artificial materials with new features has been a key to the spectacular technological advances of the last decades. In particular, in addition to the analysis and synthesis of materials with special electric and magnetic properties, their fabrication and characterization are topics of high strategic relevance, in view of their potential impact on a variety of leading edge technologies, including not only telecommunications but also aerospace, RF-MEMS, biomedical engineering and the science of materials. Advances in the research topics of Dr. Kiziltas group will allow, for the first time, integration of the best simulation tools and design algorithms to generate totally novel and yet unthinkable designs that will lead to a new paradigm in design. This goal being the essence of her research group, the outcome of these investigations will have tremendous impact on not only microwave devices such as multifunctional novel antennas but also on energy and biomedical applications. Controlling parasitic leakage and secondary flows holds the key to achieve higher power and efficiency in modern gas turbine engines. Sealing and clearance control is a major issue in turbomachinery design and operational life. Interface sealing controls turbomachine leakages, coolant flows, and dynamics. Sealing is the most cost-effective method of enhancing engine performance. These seals are subjected to abrasion, erosion, oxidation, incursive rubs, foreign object damage, and deposits. They are also exposed to extremes in thermal, mechanical, and aerodynamic loadings including positive and negative strain ranges, large case distortions and impact loadings. With proper sealing improvements at critical interfaces dramatic efficiency improvements can be possible. Advanced sealing research at SU focuses on brush and cloth seals. The research include analyses of stiffness and rotor contact loads including frictional effects, seal thermal analysis, hysteresis/hang-up or blow down, bristle stresses, fatigue life, and oil lift analysis for sump seals.